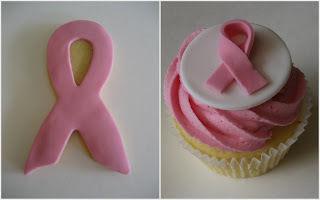 One of the offices in our building is holding a Pink Ribbon Breakfast on Wednesday 21st October, but as i will be away from the office that day, i wanted to do my bit to contribute so i decided i would make some cupcakes and cookies, sell them to my team mates tomorrow and donate the money to the National Breast Cancer Foundation. The cupcakes are my fave, yummy vanilla, topped with a pink (ofcourse!) buttercream swirl and then a disc of white fondant with a pink ribbon. I actually bought a ribbon 'mould' but the fondant just kept sticking to it, so i made the ribbons myself by cutting a thin strip of fondant and folding over. I haven't used buttercream on cupcakes in quite a while and i must say i missed using my 1M tip! I love the swirl!! I had lots of fun making the cupcakes and cookies and can't wait to sell them off tomorrow!